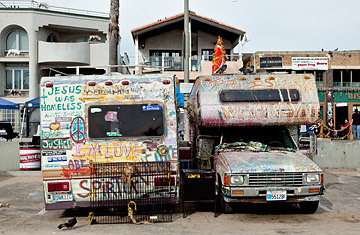 Homeless people live in motor homes and campers near Venice Beach, Calif. The State of Homelessness in the U.S.
Tim Barker never thought he'd have to live in his truck. Four months ago, the plumber was in a one-bedroom apartment in California's San Fernando Valley, with a pool and a Jacuzzi. Then, on his birthday in October, he and 199 other plumbers were laid off by their union, Local 761 in Burbank. Now Barker's son sleeps on the sofa of his cousin's one-bedroom Hollywood apartment, and Barker sleeps on the roof of the apartment building  or in his 2003 Ford Ranger pickup. "I'm 47, and I've never lived in my car," says Barker, a husky 220-lb. single father with sandy hair and a rapid-fire voice. In January, as torrential rains pelted the streets of Southern California, father and son were sleeping in the truck in San Pedro, next to the Los Angeles Harbor. "We were able to spend four nights in the Vagabond Motel, but for two nights we slept in the car," says Barker. "It was raining, cold, and the cat was jumping on us. We both got sick." For people who cannot afford rent, a car is the last rung of dignity and sanity above the despair of the streets. A home on wheels is a classic American affair, from the wagon train to the RV. Now, for some formerly upwardly mobile Americans, the economic storm has turned the backseat or the rear of the van into the bedroom. "We found six people sleeping in their cars on an overnight police ride-along in December," says John Edmund, chief of staff to Long Beach councilman Dee Andrews. "One was a widow living in a four-door sedan. She and her husband had been Air Force veterans. She did not know about the agencies that could help her. I had tears in my eyes afterwards." "Cars are the new homeless shelters," says Joel John Roberts, CEO of PATH (People Assisting the Homeless) Partners, the largest provider of services for the homeless in Los Angeles County, which had nearly 50,000 people homeless in 2009. Of these, experts estimate that up to 10% live in vehicles  even though doing so is illegal in most of the county. A similar situation is true for many other regions across the nation, especially in the Sun Belt. A woman lives in her BMW in Marina Del Rey, a swank L.A. address on the coast. PATH outreach workers Jorge Guzman and Tomasz Babiszkiewicz say she was an executive recruiter until the Great Recession. "She was self-employed for 36 years," says Guzman. "Now she sits in the car with a blanket and reads. She has not told her daughter." Barker, the out-of-work plumber, has checked out shelters, motels and homeless-assistance programs throughout the Los Angeles area as he scrambles to find a roof for his son and him to sleep under. "We went down to a shelter in downtown, but it was bad  heroin, crack, smells. Randy looked at me and said, 'Dad, get me out of here. It's spooky.' Now I am trying to get assistance to get into an apartment in San Pedro so Randy can get back in school." PATH outreach workers are talking to Barker about his possible eligibility for federal assistance with rent and utilities under the new federal homelessness-prevention program. One problem Barker has discovered with living in a pickup truck is keeping track of things. "My cousin is our ace in the hole," Barker says as he stands in a crowded one-bedroom apartment that has seen better days. On his cousin's cluttered coffee table sits a worn yellow briefcase covered with union stickers; it's stuffed with unemployment forms, birth certificates, old utility bills and school application papers for Randy, a skinny 12-year-old who loves basketball. People who fall into homelessness say it feels like a spiral. A layoff, a medical emergency or a domestic quarrel sets off a chain reaction of bad luck. And the risk of falling into the economic abyss has increased, even in better times. Writing before the housing bubble burst and Wall Street collapsed, Yale political scientist Jacob Hacker showed that the big difference between 30 years ago and today is the dramatic growth in income volatility. American family incomes now rise and fall much more sharply from year to year, and this is happening at the same time that public and private safety nets have eroded.